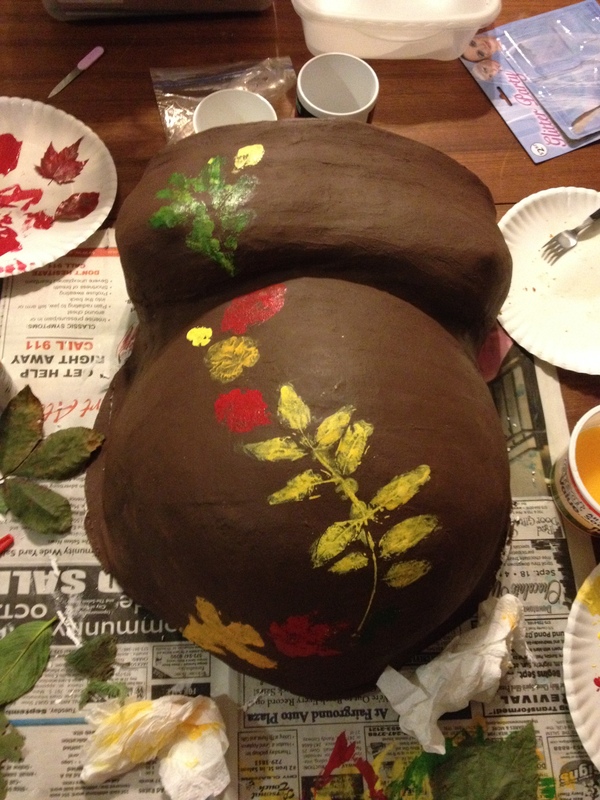 When I closed my last post, we’d just finished making my belly cast in anticipation of decorating it as part of my mother blessing ceremony. 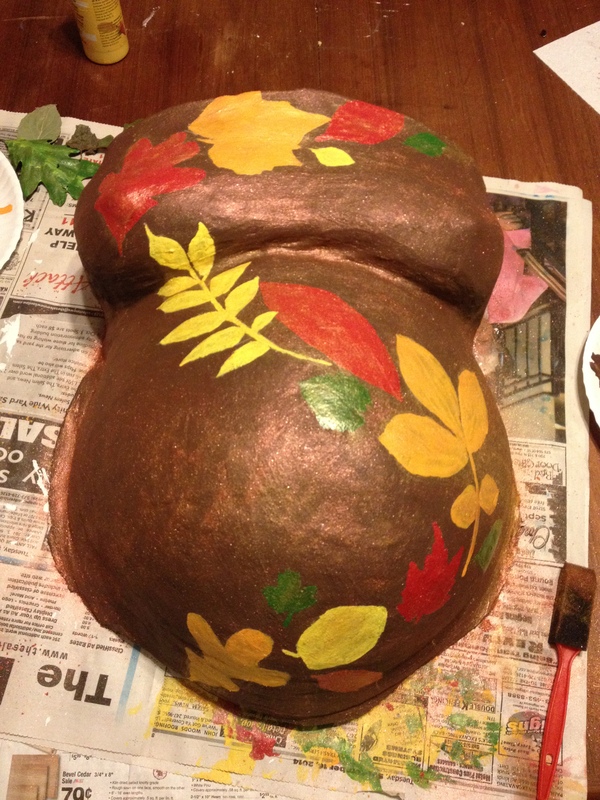 I had an idea though and I started to think perhaps I wanted to paint the belly cast myself after all! I walked around our land picking different leaves. I picked one from my grandma’s memorial hydrangea, my little Noah’s memorial magnolia, our vineyard, and then other leaves from each tree in my special place in the woods. 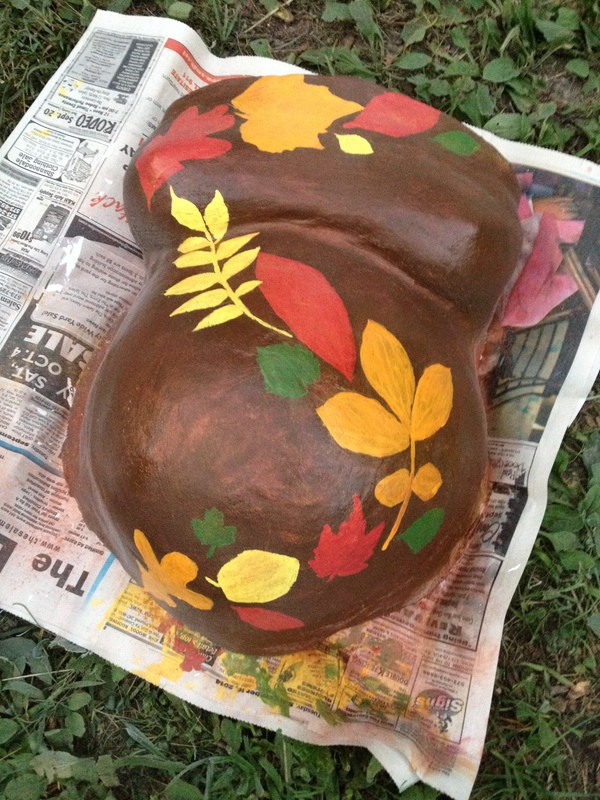 One of the reasons we settled on Tanner’s name is because one of its meanings is “forest.” I knew I wanted to paint the belly cast brown and imprint the leaves onto it like stencils. It turned out that we didn’t have enough time at all to even consider painting the cast at my mother blessing. 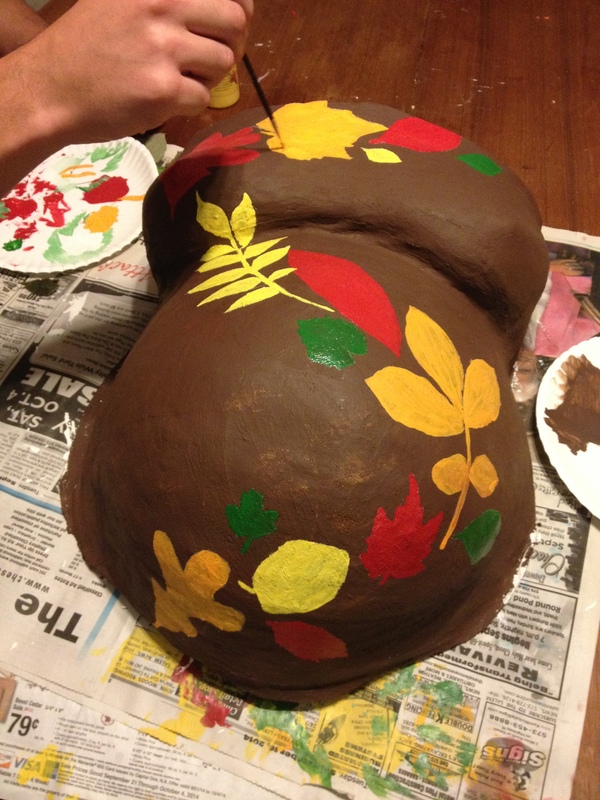 So…the next evening I got it set up on my mom’s kitchen table and started painting it brown. My aunt and cousin who is in his early twenties were visiting from California and I had to laugh at myself as he walked through the kitchen at 10:30 that night as I sat at the table painting a large cast of my own form without making any comments about it. Yes, this IS the kind of thing I do in the middle of the night in the middle of someone else’s house… 😉 Alaina helped me paint it. The following day, I started to stencil my leaves and…uh oh. It did not turn out the way I was envisioning at all! I posted a picture to Facebook and got some good suggestions and ideas about adding sparkles and gloss as well as some compliments saying that it was great the way it was and I didn’t need to let perfectionism ruin it! Still, the wind was let out of my sails. I knew what I’d wanted and this wasn’t it. I painted over the leaves with more brown that night and felt fairly dejected. The next day, my aunt offered a genius idea: tracing my carefully collected leaves onto the cast with white pencil and then painting them in. My mom offered the idea of soaking the now-dried-out leaves to help them be more pliable and useable again, since I really didn’t want to go tromping all around again re-picking everything. It worked! Mark and I worked on the leaves together. After the leaves were finished, we brushed over the paint with copper and gold mica pigments like I use on my own birth goddess sculptures, which felt like a fun connection. We hung it up near my other two casts (it is definitely bigger!). Happy October! It is now my due month and I can hardly believe it! The change in the air towards fall as well as having pregnancy pictures taken, making a belly cast, and having a mother blessing feel like they have shifted my mindset (and heart!) 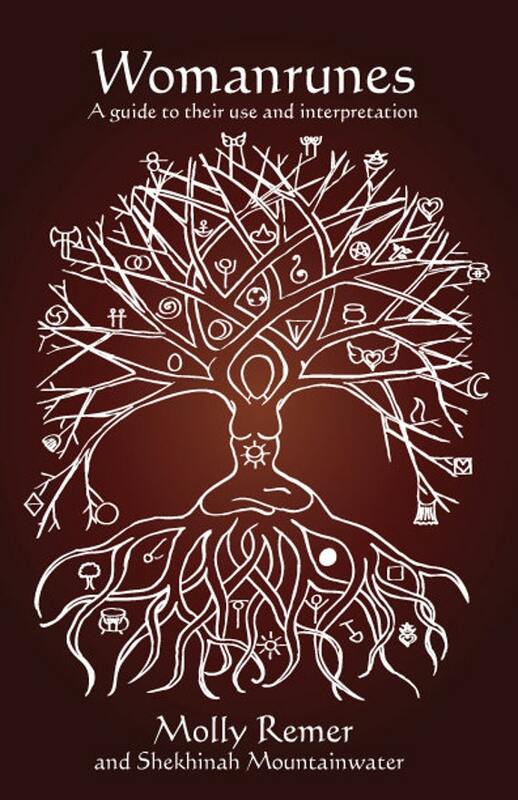 away from feeling like my October due date is a “deadline,” and more towards celebration, anticipation, and appreciation. I hope to do some more posts soon about the ceremony.